To view Active Listings in Long Branch click here Long Branch Real Estate. Long Branch, one of the largest cities on the Jersey Shore, was one of the most earliest and glamorous resort destinations in the country from the 1860's to the First World War. The city's first leisure guests originally came from Philadelphia, then from New York after the Civil War. Although Mrs. Lincoln visited in 1861, it was President Grant's first visit in 1869 that gave Long Branch its cachet. Grant visited every summer he was President and many summers after that. In 1870, a racetrack opened and casinos soon thereafter, and during the 1880's and 1890's, the community's reputation as a fashionable place was at its height. The Ocean Place Resort has carried this history through today and adorned its meeting halls with photos of these famous president's as well as named meeting rooms after each. Other famous people who visited Long Branch include the Astors, Fiskes, Goulds, Biddles, and Drexels, high liver Diamond Jim Brady, General Winfield Scott, actors Edwin Booth, Lillie Langtry, and Lillian Russell, painter Winslow Homer, and writers Bret Harte and Robert Louis Stevenson. Long Branch is home to Seven Presidents Oceanfront Park, named for the United States presidents who visited the fashionable resort town, including Ulysses S. Grant, Chester A. Arthur, Rutherford Hayes, Benjamin Harrison, William McKinley, Woodrow Wilson and James Garfield. Garfield was a frequent visitor, and after an attempt on his life he was brought here in the hope the sea air would help him recover. In fact, a half-mile railroad spur from the main line to a cottage was built so his journey could be more comfortable. Many are not familiar with the rich history of the Jersey Shore. Known today for its white sandy beaches there is more to learn about Long Branch that defines the character of this coastal community. There are several distinct neighborhoods and areas in the City of Long Branch, each with its own character. Among these are North End (once known as "Atlanticville"), Branchport, Beachfront North and South (including Pier Village, adjacent to the site of the former Long Branch Pier at the foot of Laird Street), Downtown, Uptown, West End and Elberon. As the city's now famous redevelopment initiatives continue to grow, the lower Broadway area (a portion of the city's Downtown) will become an Arts District. One of the first successes of the art district has been the Shore Institute for Contemporary Art on Broadway and Third Avenue. In years past, Long Branch was a major destination for beachgoers. Long Branch's previous fame as the Nation's First Seaside Resort was waning in the years following World War II. The defining moment marking the end of this era occurred on June 8, 1987 when the largest fire in the history of the city destroyed the landmark amusement pier and adjoining Haunted Mansion, "Kid's World" Amusement Park and other businesses. Over the course of the twenty years since the fire, several municipal administrations have tackled the issues relative to the city's rebirth. Only recently has any of these efforts resulted in tangible evidence of a rebirth. Long Branch is connected to New York City and Northern New Jersey by the New Jersey Transit trains that run on the North Jersey Coast Line. The Long Branch Train Station marks the end of electrified trackage and passengers continuing south must change to diesel-powered trains. Long Branch Train Station is only three blocks from the beach, and a second station is located in the Elberon section. According to the US Census Bureau, the city has a total area of 6.2 square miles, 5.2 square miles of land and 1.0 square miles of water. Long Branch is Monmouth County's largest city. When you ask what's new at the Jersey Shore, the answer will most likely involve Long Branch. Always a popular spot for surf, sun and shore fun, the town, with its cutting-edge residential beachside condos and restaurants at Pier Village, has created a buzz all along the northern shore. Although it's one of the ritziest spots at the beach, with Avenue (an upscale restaurant), Avenue Nuit nightclub and Le Club beach club, there´s plenty to do even if you don't have deep pockets. During the summer, there are free weekly outdoor concerts and movies under the stars and year round historic sites, parks, shops and restaurants that offer something for every interest. One special spot is Seven Presidents Oceanfront Park. The park comprises 38 acres and offers an ocean beach, swimming, fishing, boating, volleyball plus a boardwalk. Don't miss the Windmill (200 Ocean Ave.) for the best fries in the state, according to the readers of NJ Monthly Magazine or Max's for one of the best hot dogs around. Oceanfest is on of the largest July 4th celebrations in the state and can be found on the Long Branch Boardwalk. The famous Strollo's Lighthouse is now open in it's new location across from Seven President's Park with the best Italian Ice around. McLoone's Pier House in Pier Village has made quite a name for itself since it's opening in Spring of 2005. With dazzling oceanfront views, delicious cuisine and friendly service, McLoone's Pier House has become the place for weddings, parties, entertainment and scrumptious indoor/outdoor dining. McLoone's Pier House is a partner restaurant to the beloved McLoone's Rum Runner in Sea Bright. Sirena Restaurant with oceanfront views at Pier Village has great food which makes this Long Branch Italian restaurant a top destination at the Jersey Shore. The atmosphere at Sirena's is relaxed and comfortable. In the summer, make sure you make reservations well in advance to secure a table. The nightlife at Pier Village kicks up in the summer at Le Club and at the Avenue Restaurant that ajoins Sirena. Avenue Restaurant is one of the hot dining and club destinations on the Jersey Shore. Located in Pier Village, Avenue provides an elegant oceanfront dining experience. A private club and rooftop pool are included in an exclusive membership package. Enjoy the beauty of Long Branch on the Jersey Shore in New Jersey. Bordered by Monmouth Beach and Deal, this makes Long Branch a desirable city to live. Enjoy the easy going environment in Long Branch, from watching the sunset along the Atlantic Ocean to a refreshing swim or just a stroll on the boardwalk. Coastal living in Long Branch with shopping and relaxing on the gorgeous beaches is why the residents adore this lifestyle. In Long Branch, there is entertainment at the Pier House's fine oceanfront dining facility. There are many shows and attractions on the Boardwalk Promenade that bring visitors to return time and time again. Pier Village is now complete with many shops and restaurants along this beautiful four mile stretch of oceanfront. Ocean Place Resort, the premier hotel between New York City and Atlantic City, is within walking distance of Pier Village. The Bungalow Hotel, a stylish boutique hotel, is the newest addition to the Pier Village area. Pier Village was honored with the 2009 New Jersey Governor's Tourism Award. "Beachfront North" development boasts condominiums and townhomes on the oceanfront. The site of an additional planned development south of the hotel to be called "Beachfront South" borrows its name from the amusement pier that once stood at the end of Laird Street. The city also intends to rebuild a pier at this location with ferry service to NYC. Long Branch still continues to be a popular resort area. Many people from New York City travel or settle into the area to escape the crowded city and enjoy the benefits of Long Branch's beaches. The area also attracts some tourists from the Philadelphia area as well. 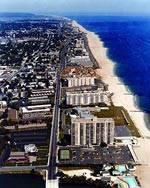 If you are interested in finding properties for sale in Long Branch we are here to help. Whether you are a first time home buyer or an investor, having a qualified Long Branch real estate specialist will be a great asset in making your home buying experience more enjoyable. For those thinking about placing your Long Branch home for sale, you can trust that you will receive help pricing and effectively marketing your home. Having a seasoned consultant available to you is beneficial if your are considering investing in Long Branch. See what makes Long Branch not only a great investment, but a wonderful place to live. A unique opportunity to own Long Branch real estate is here at the Jersey Shore. I invite you to visit the Long Branch website. If you would like more information about buying or selling Long Branch Real Estate please contact Carol Mazza at 732-768-9404.